The Is My School a Better School Because I Lead It? 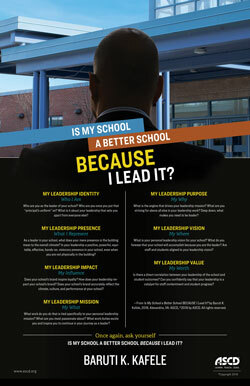 poster allows school leaders to keep in the forefront of their minds the seven key leadership components—identity, presence, impact, mission, purpose, vision, value—that they must keep in mind as they determine if their school is a better school because they lead it. 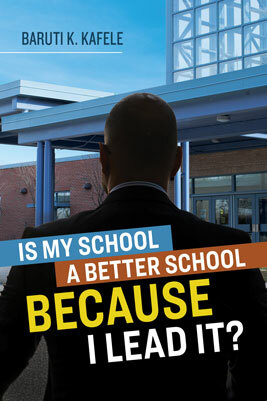 "This is an easy-to-read book that cuts to the heart and mind of effective school leadership. As a retired school leader with 23 years as a principal and now teaching educational leadership courses to prospective school leaders, I find this book forces the reader to look at whether or not the reality of one's school leadership does, in fact, make the school a better school!" Baruti Kafele has been a highly regarded urban public school educator in New Jersey for nearly 30 years and has distinguished himself both as a classroom teacher and as a school principal. As an elementary school teacher in East Orange, New Jersey, he was selected as the East Orange School District and Essex County Public Schools' Teacher of the Year. As a principal, he led the transformation of four different schools, including Newark Tech, which went from being a low-performing school in need of improvement to being recognized by U.S. News and World Report as one of the best high schools in the United States.